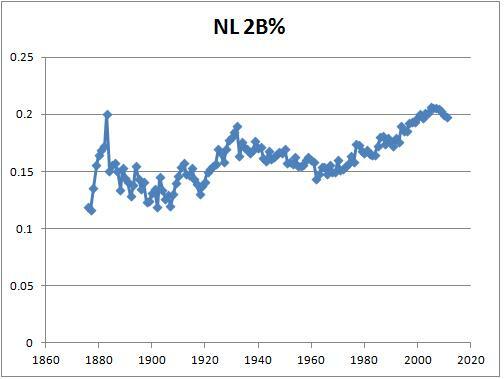 The graph below shows the numbers for the AL. Why Are The Red Sox Just a .500 Team If They Have a +47 Run Differential And An OPS Differential of +.039? They hit well with runners on base but their pitchers do very poorly with runners on base and both the hitters and pitchers do poorly when it is close and late. This post was inspired by what David Pinto wrote at "Baseball Musings." See WPA I Can Use. David's post was based on Tango's post WPA insights which in turn linked to Dave Studeman's article Detailed standings at the all-star break. Here is what I posted at "Baseball Musings." 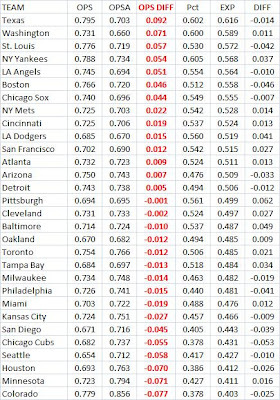 How can a team which hits so well with runners on base do so poorly when it is close and late? Are they at a platoon disadvantage? Just bad luck? 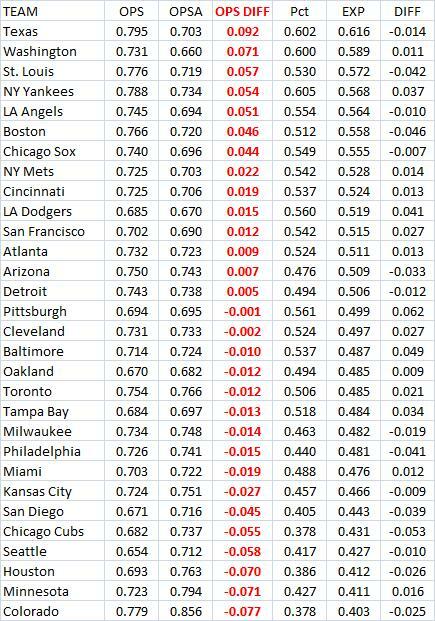 So it looks like their pitchers do much worse with runners on base. So their pitchers do worse when it is close and late. Is "Pitching To Contact" Helping The Nationals? The Yahoo Sports baseball page has a feature article on this. It says "New alphabet: Fewer K's, more W's for Nats: Washington's emphasis on pitching to contact is paying off in victories." The article then is Nationals pitching coach Steve McCatty believes fewer K's equals more W's, and so far so good by Les Carpenter. I really don't see any statistical evidence offered to support this in the article. This year the Nationals are 3rd in the NL in strikeouts per 9 IP with 8.3 and they have an ERA of 3.21. Last year they were 15th in the NL in strikeouts per 9 IP 6.5 and they had an ERA of 3.58. So it actually seems like they are striking out more batters and their ERA is lower. 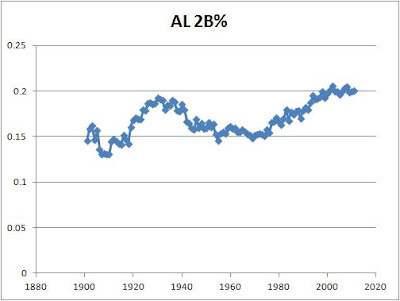 "To look at this, I calculated the batting average and slugging percentage in the AL in 2010 on contact. For contact, I used AB - K + SF. I assumed that sacrifice hits (bunts) and their attempts rarely end up in strikeouts. So in the AL last year when a plate appearance ended in contact, the AVG was .320 and the SLG was .501. That comes from regression analysis based on the 2007-2009 seasons. Last year the AL had a leage OBP of .327 and a league SLG of .407. The equation predicts that would lead to a runs per game of 4.44 (it was actually 4.45). But if we used .320 for OBP and used the .501 for SLG, we get 5.44 runs per game. That seems like a big difference. I am not sure if this approximation works. It would be quite a different game with no walks and the denominator for OBP and SLG is not the same in each case. But even with that said, I am skeptical that pitching to contact (or not trying to cause batters to miss the pitch) is a good idea." This was posted to SABR-L on June 24 by David Vincent. Can Brett Lawrie Set A New Single Season Record For Defensive WAR? About half way through the season, he has a defensive WAR of 3.4. The current record is 5.4 by SS Terry Turner in 1906. The only other season with 5 or higher is 5.1 by Art Fletcher (SS) in 1917. Update: After the July 3 game, he is up to 3.5. That is tied for the 51st best fielding season ever. If he stays on this pace, he would end up with 7.0, beating the old record by 29.6%. It looks like he had 5 assists and a putout last night. In his career he now has a defensive WAR of 5.1 in just 120 games. The single season record for a 3B man is 4.5 by Brooks Robinson in 1968. It looks like Lawrie is already in the top 10 seasons for 3B men. "The Book" blog had an interesting discussion of Lawrie's defense in May. Part of it has to do with where he stands when the Blue Jays put on a shift, which can affect hs stats. See Has Brett Lawrie ALREADY saved 14 runs so far this year? The table below shows some key percentages. For the percentages, I divided by PAs (with IBBs and SHs being taken out). I included HBP in walks. Strasburg has the big edge in SO% while Sale is ahead in HR% and BB%. Now let's say they each face 36 batters in a 9 inning game and we use the values from the fielding independent ERA. At 1.4 runs for a HR, Sale is just about .2 runs better. On walks, at .33 runs for a walk, he is also about .2 runs better. But using about .2 runs for strikeouts, Strasburg is about .41 better. That makes him about .1 better.